Analog/Digital: eReader/Tablet Review: Barnes & Noble Nook HD 7"
eReader/Tablet Review: Barnes & Noble Nook HD 7"
Nook HD 7" and a piece of toast, courtesy of barnesandnoble.com. I don't know why. Virtually every article about improving one's academic workflow (note-taking, reading, writing and general office/mobile productivity) begins and ends with the iPad. In some respects, makes a lot of sense. On top of design, branding and marketing elements, Apple also has the advantage of a well-stocked app store. An important trade-off here is a hefty price tag. Meanwhile, there are plenty of devices for well under $200 that offer promising features and competitive app stores as well as the ability to sideload content and apps. Android devices, for example, fit the needs of students and academics extremely well, if not better than their Apple counterparts. First and foremost, many Android or even Windows phones and tablets are more likely to have expandable memory, which is great if you don't keep all of your files in cloud storage and/or if you are not likely to have a regular data or WiFi connection (such as in the field). Which brings me to my next point: academics actually have a particular and sometimes peculiar set of needs for their devices. These admittedly vary from person to person, by discipline, age, work environment and place on or off the departmental food chain. For me, I focus mainly one three major tasks, in order of importance: 1. Reading. A lot of reading. 2. Taking and making notes. 3. Saving and organizing files. Everything else from photos and video to social media is secondary for the purposes of this review, but certainly not altogether unimportant. There are a couple more caveats. I'm a strong believer that you should only ever invest in the technology you need instead of overspend on technology you'll never make full use of. So it's best to read this review keeping in mind how you like to work and what you find necessary or unnecessary; intuitive or counter-intuitive. A lot of people come to me for advice about buying tablets or other gadgets. I wish I could say that it always surprises me how often they fail to consider actual needs - what they'll be trying to do with the device - rather than its looks, brand name or quirky functions (that phone doesn't have the app where I can remote start my car's ignition from Mars, I'd better spend the additional $200 and upgrade my service plan ...). If you were taking a tablet to the field for actual fieldwork tasks (interviews, etc. ), I would likely recommend something designed for that kind of work, like the Galaxy Note 10.1 or potentially an iPad, but that is a separate review. Even though I'm a lover of gadgets, for day-to-day use, I actually find tablets rather fiddly for things like social media or anything that involves a lot of typing. I don't play games, listen to music, Skype chat or even watch videos on mine. I have a laptop with internet access, a phone and a media player, so I don't need a tablet to recreate all of the functions that these individual devices do very well. Instead, I want it to supplement the repetitive and/or arduous tasks that my other devices do rather poorly. That is, I need a more effective portable library to store, read and annotate PDFs and eBooks. As it happens, the Nook HD 7" is excellent as both an eReader and a tablet and is therefore worth reviewing as for a device to help academics go paperless on a budget. That said, it's far from perfect. B&N mostly makes eReaders like the highly rated Nook Simple Touch. Indeed, after B&N's earlier stumbles with the Nook Tablet and Nook Color, the Nook HD itself started its life as more of a glorified eReader than a full-fledged Android tablet. Upon its release, the Nook HD series was burdened by lackluster software including a useless web browser and a very limited app store. However, the recent Google Play update (late 2012) bumped the NookHD/HD+ into fully fledge Android tablet terrain – albeit still somewhat constrained by B&N's restricted version of the operating system - and returned this once unassuming device to my radar. Those with the technical know-how can root it fairly easily to free themselves from B&N's walled garden, but most general users won't need to. (Rooting voids your warranty, which you might not want to do given a software glitch that affects these devices within the return period. See below. Also, regular software updates from Nook will break your root). Just run the update out of the box to get full access to the Google suite of apps including the Play Store, Play Books, Music, Magazines, Chrome web browser, etc. I chose the 7" HD because it's a good crossover device and therefore best value for my needs. It allows me to read and markup my thousands of academic PDFs while also being lightweight and comfortable enough to read novels. 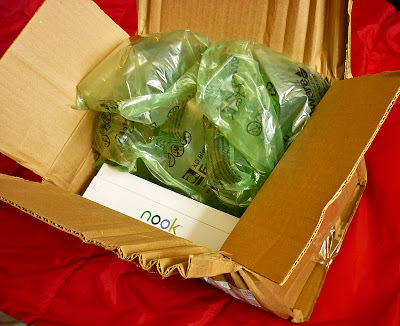 I have something like 2,000 books and articles on my Nook HD added in the three months or so that I've owned it. It also comes in a 9" (HD+) option, which is probably best suited for purely academic work because you get more screen area to work with, so those three-column academic papers require less zooming/scrolling. Socio-cultural anthropology doesn't get much of these multicolumn pages, but my recent foray into cognitive anthropology has been another story. The 7" version is optimal for all other types of books. The lower profile and weight reduces wrist strain and is preferable for those with smaller hands like myself. I tried both out in my local B&N, where they were the same price ($149 for 16GB. There's an 8GB 7" for $129 while the 9" 32GB is $179) and went for the 7" for portability even though the 9" screen was appealing. They've been on sale for as low as $79. The full technical specs for the Nook HD are available here. I'll go over what I see as the key points, especially those specs that stand out from the competition. Speed: the device is fairly nippy with a Dual Core 1.3ghz processor and 1GB RAM. It runs Android 4.0.4 Ice Cream Sandwich (modified by B&N). Storage capacity: Internal storage varies by price (see above), but you get virtually unlimited storage space because it takes micro SD memory cards up to 64GB for expansion. Not only is this great to have and a definite advantage over other devices that lack expandable memory, but in the case of the Nook HD, its software makes storing your files on an external card highly recommended (again, more on this below). Expandable memory is noticeably absent from the Google Nexus, iPad mini and Kindle Fire HD/X. Connectivity: On one hand, the Nook HD/HD+ require proprietary charging/data cables which are pretty expensive to replace in the US. On the other, the device charges really quickly compared to, say, the Amazon Kindle HD. I can get a full charge from empty in around 1.5 hours. WiFi-only for downloads and no NFC. Battery life: Out of the box, I estimate about 9 hours for reading, but just going through the menus and flipping between apps can have noticeable effect. Since I mostly read, I've turned down the screen brightness for comfort and get up to 14 hours on a single charge. It hardly uses any battery on standby. I can pick it up two days later and the battery will have drained only 1-2%. Pixel Density: Booklovers are already in on the Nook's secret. The screen resolution of 1400x900 at 243 pixels per inch is ideal for – you guessed it – reading. This means much less eye strain if you spend hours pouring over ebooks and documents. Text and images render beautifully crisp and clear. For comparison, 250ppi is the benchmark for the "retina" display that you pay for with Apple and the eye can't make out more detail beyond that point. 243ppi bests the comparable tablets in its price range like the Samsung Galaxy Tab 7", Google Nexus 7" (2012) and even the Kindle Fire HD 7", its most direct competitor as an eReader turned tablet. This alone was a major reason why I chose the Nook HD and it does not disappoint. 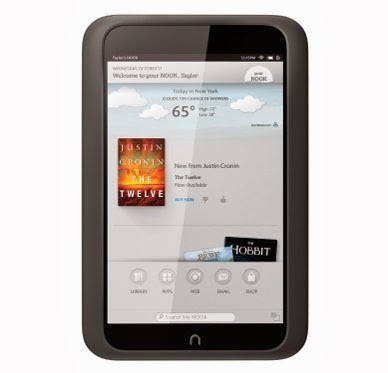 The Nook HD measures 7.7"x 5.0" x 0.43". The screen is the same size as other comparable 7-inch tablets, but it can give the impression that it is smaller/narrower due to the noticeably wider bezel. The aesthetic impact is debatable, but I actually prefer a wide, grippable bezel so you can hold the device comfortably without getting your fingers all over the screen. The fact that the frame is plastic gives it a somewhat cheaper look, but it also allows the tablet to weigh in at a mere 300g, which is a fair trade-off for me. Plus, the plastic is reminiscent of the portable devices of yesteryear that were markedly more durable against everyday wear. Overall, the device resists fingerprints fairly well. It also has a really comfortable soft-touch rubber backing that feels very stable in the hand and is completely the opposite of the cheaper appearance of the front. More bothersome is the build quality of the buttons and the sd card slot. The volume and power buttons and SD card slot protector are a cheap, clicky plastic which is shiny unlike the matte finish of the rest of the body, almost like an afterthought. The card slot protector feels extremely flimsy. Most of the superficial flaws can largely be mitigated by the various protective accessories (cases, skins, folio covers, etc) available, but if the card slot breaks off, you're pretty much stuck getting dust inside. Another very obvious shortcoming for the Nook HD when compared with, say, the Kindle Fire HD, is that there is no front- or rear-facing camera. No camera at all. I would have liked to see a front camera at least for the occasional Skype chat, but it's not that big a deal for me personally. However, because there is no camera, not all Android apps are supported, including Skype and anything that requires photos/videos or scanning. If slight build issues were the only thing to contend with, this would be a near-perfect device at such a low pricepoint. Unfortunately, one major flaw with the Nook HD is that there appears to be a real problem with Barnes & Noble's quality control. I had store credit available, so I purchased my Nook from my local Best Buy. When I brought it home and opened the sealed box, the device was in terrible shape. 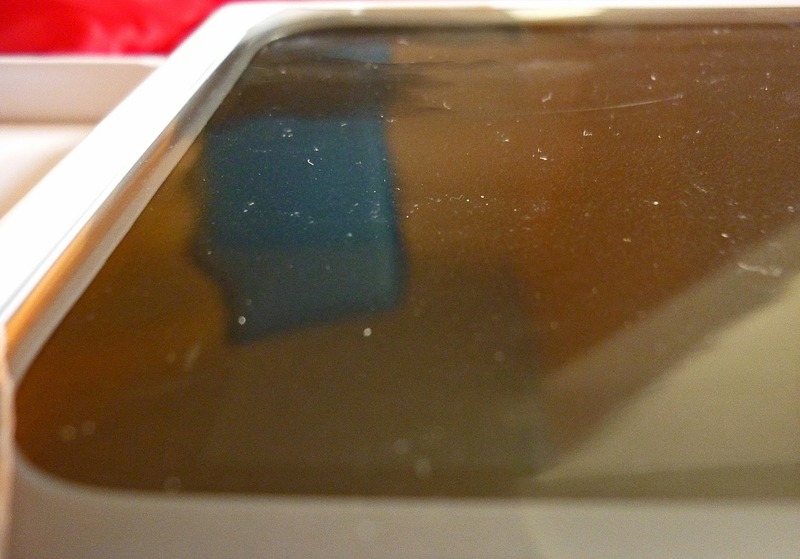 Although it shipped factory packed in protective plastic, this plastic sleeve and the tablet inside were both covered in heavy smudges and clearly marked with fingerprints. That shouldn't happen with a new device. I assumed that I was given a refurbished or open box item and went back to Best Buy for an exchange. This time, I opened Box #2 in front of a sales associate. They were surprised to find that the device inside was also covered in oily smudges. They insisted that they never open products from the factory or re-shrink wrap them, so the source of the problem had to be Barnes & Noble. I was skeptical, but called B&N to find out more. They had never heard of devices shipping in bad condition. I doubt that; but regardless, I did what most people on the Internet do and blamed Best Buy. With my return partially in store credit, I then travelled to 2 more Best Buy locations and opened 3 more Nook HD boxes in front of store managers. All had some kind of damage. In one store, the manager even tried to clean the smudges off the screen, but they wouldn't come off. In another, the bezel was broken and loose from the screen. It became clear that something was seriously wrong with the poor quality devices from B&N. Before giving up, I made a last ditch effort to order from the Best Buy website. It arrived with out any trace of smudge or mark on the screen. Success! However, the inner plastic tray that holds the device was cracked at the corner. And so there was a matching tiny gouge in the plastic bezel near the headphone jack. Quality packaging skills from the geniuses at Best Buy. Photo by author. The accordion-shaped crush pattern on the box is, I assume, courtesy of UPS. It's nice when companies work together to give you great service. The screen was flawless and it booted up, so I kept it instead of making a fourth return which would cost me more in gas than the device itself. This is pretty abysmal quality control and prevents me from rating the Nook HD higher than 3.5 stars. That's without even turning it on and thus negates many of its admittedly positive attributes. As an aside, Best Buy was extremely accommodating with my request to keep opening and discarding Nooks free of charge, whereas B&N customer service is pretty useless. When I reported the units damaged, they could only offer a refurbished device as a replacement and also proceeded to deny that their products leave the factory in bad shape. A quick check of YouTube unboxing videos shows their smudges are common. Although the software might seem a little clunky (sometimes a lot of actions are required to arrive at a simple task), I actually find it reasonably intuitive. The fact that it's aimed at a wide audience, and with Nook's paired-down focus on reading, means that it's simple to use and learn how to navigate. Opening files is extremely fast, scrolls well and is very comfortable. As mentioned above, access to the Google Play store means that the old complaints about restricted operating software are rather moot for most users. Out of the box, the interface is fairly customizable, with personalized lock screens and wallpapers, widgets, recent documents carousel and sliding desktop screens for categorizing icons. It's certainly nice to look at, if not the most functional if you're in a hurry. There are interface apps you can download to tweak the appearance without rooting. The modified Nook version of Android includes a Nook Today screen which basically tries to sell you eBooks based on your interests (okay concept, but I wish I could add other retailers to that screen. Sorry, B&N, you're too expensive). It also supports multiple user accounts and parental controls, neither of which I make any use of. The library menu is pre-organized into categories or shelves by Nook that you can't change, including Books, Documents, Magazines, Catalogs, etc. Anything you put into these folders on the device or the matching folders on your SD card will show up there, with the exception of the Documents folder (I can't fathom why). As a result, all books and journal articles stored on the SD card must go into Books if they are going to show up on the device. But then they show in one massive list that is cumbersome to sort. That's irritating. You can create new "shelves" (also cumbersome because they get hidden under "My Shelves"), but not get rid of the default ones. If you buy a magazine from the Nook store that B&N misclassifies as a "Book", you can't move it between shelves to rectify the problem and customer support couldn't care less. Similarly, you can install new apps, but can never get rid of the ones that come pre-installed (like Hulu Plus, Facebook and Pandora). Even if you click "uninstall" or use a file manager app to force it to uninstall, the next time you put your wifi on, they'll download again. A workaround is to hide the offending apps from your user profile. The same applies to books that you've purchased from Nook. If you want to archive them to the cloud, you have to do so from the B&N website or they'll keep coming back even after you try to hide them. The software is full of little annoyances such as these, but, in general, nothing too major. A custom launcher or file manager app can be an instant remedy to most organizational issues, so it's not worth getting too hung up on the interface. On the plus side, Nook's native reader application is actually very good. It's light, fast and sleek, supports a wide range of file types, and is easy to use. For regular eBooks (ePubs) the Nook Reader app is as good as any alternative from the Play store. For catalogs, magazines and graphic novels, the Zoom View feature automatically adjusts the page turns to take you to the next relevant section or block of the page while making the best use of the screen real estate. You can also read PDF files in the native Reader app, but I recommend a third party PDF reader for the kind of intensive reading, annotating, editing and highlighting that students and researchers are often engaged in. I'll write up another review for the best Android apps for academics soon where I will go through the various PDF readers, but the app market has quite a few to choose from. From the ones I've tried on the Nook thus far, note-taking, highlighting and annotating functions really well, attesting to adequate screen sensitivity. In short, with a PDF reader installed, the Nook HD becomes an ideal device to read/download academic content. Another B&N perk is that you can get free wifi at any B&N location. Plus, while you're in store, you can read any books you want for up to an hour. If you have a nice B&N nearby or on campus that can be useful, even if only for reading new bestsellers or novels for free over a series of visits. The Overdrive app also works on Nook, giving you access to eBook loans from your local public library and any participating university libraries. The software is easy enough to get used to with next to no learning curve. Sadly, I encountered a serious glitch that is now impossible to overlook and has long-term affects on usability. I'm referring to it here as the "99% error" and together with B&N's failed quality control, it forces me to cap my overall rating at no more than 3.5 stars. Basically, randomly and for unknown reasons, the Nook freezes during boot-up. Reports from user forum discussions indicate that some sources of the freeze include following a software update or after modifying user accounts, or, in my case, after the unlock screen froze and I had to reboot the device. Instead of fully booting, the screen locks at 99% loading and never loads the interface. The battery would simply drain if you let it keep "loading". The next time you charge it and turn it on, it would again only get to 99%. There are various suggested remedies to fix this, but a hard reset to factory settings is the only thing that really works. Having to hard reset a device happens from time to time and is not that big a deal. What is a big deal is when you can't actually access the device to back up your files before doing so and there's really no way to tell if or when it's going to happen. This is where I have trouble recommending the Nook if you tend to gather a lot of local files like notes, images and annotations. Apart from the SD card, anything stored to the device memory and not in some cloud service (apps and most app data in Google Play are safe) will be wiped in the event your Nook freezes and needs to be factory reset. This makes regular backups of any data on the drive an absolute must. However, even more annoying is that if you have made any notes or highlights in your eBooks using Nook's native Reader app, this data cannot be backed up anywhere. You can't even export highlights/notes at regular intervals for your own data preservation. Unlike Amazon Kindle's whispersync service, even your Nook books purchased from B&N will lose their bookmarks, notes, highlights and annotations. The workaround is using a third party app that allows exports (I have not found one that will do this automatically). Even then, all you will have is a separate file with a list of highlights and annotations. You can't import them back into the book's text again. You'll also need a file manager to move any exported files to your SD card from the Nook's internal memory, and that's something novices will probably struggle with. Some apps put files in places on the Nook that appear to fall haphazardly into the My Files category. Making sense of where everything is stored to get your backups right will get more confusing as time goes on and more of the space is used up. It's kind of a mess. The potential to lose all data stored to the internal memory means that it's safer to keep all documents on the SD card except for app data. This should irritate anyone who, like myself, paid extra for 16GB onboard storage ... but at least I have plenty of space for apps? I would absolutely recommend this device as an eReader (with the caveat that even though the Nook Reader app is great, you'll want to install one that allows some kind of backup if you like to keep your reading notes). I am also confident in recommending it for academic users, because of the availability of quality productivity apps from Google Play and the overall comfort of reading and making notes even with the limited screen size. The battery lasts for up to 14 hours of reading with the screen reasonably bright (the high pixel density means little to no eye fatigue). The screen is also highly responsive. The build makes it lightweight, portable and comfortable to hold. If the software were more stable and the quality control more reliable, this could be a 5 star device. That said, updates are still being released, so there may be a patch for any lingering issues in the future (fingers crossed).